Note: Cut bevel along front and sides only. 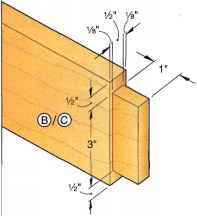 2 Adjust your tablesaw blade to 17° from vertical, set your rip fence, hold the top on edge, and cut the bevel on the bottom front edge and both ends of the top, where shown on Drawing 9, above. "Parts initially cut oversize. See the instructions. Materials key: 0-oak, OP-oak plywood, EO-edge-joined oak. Supplies'. #8x1 Vi" llathead wood screws (8), #8x3*4" flathead wood screws (8), #6x1'A" panhead pocket-hole screws (4), #6xy4" flathead wood screws (4), tabletop fasteners (4), #8x3/4" panhead wood screws (4), 1V4" round face-grain oak pulls with mounting screws (2), finish. Drawer knobs. Package of ten VA" round face-grain oak pull knobs with mounting screws. Part no. 865-889. Woodworkers Supply, 1108 N. Glenn Rd., Casper, WY 82601. 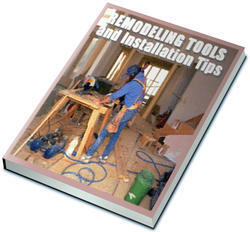 800/645-9292, or visit online at www.wood-worker.com. Plane or resaw to the thickness listed in the Materials List. IFrom a VaxIVayBG' piece of stock, rip and crosscut six pieces to Vix\ V2X28V4" to make three legs (A). (We selected poplar for the legs, leg supports, and gussets.) Glue and clamp three pairs of pieces face-to-face. Wipe away glue squeeze-out with a damp cloth, and allow the glue to dry. Got a narrow . 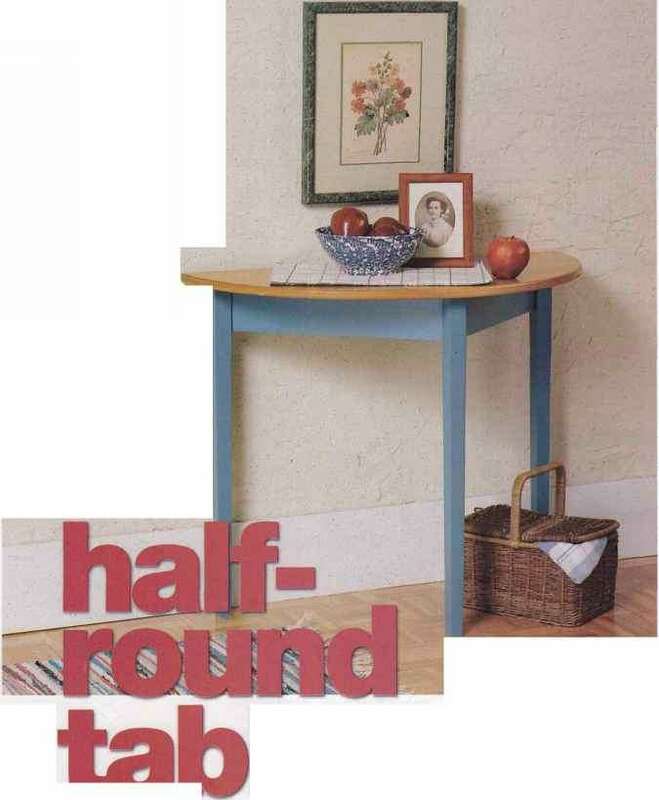 hallway or a crowded kitchen that's cramping your style? This simply styled piece will solve your problem. And it's such a breeze to build, you'll probably have half the weekend left to admire your handiwork. 3Fit each leg in turn into the jig, and set the rip fence on your tablesaw to cut flush with the jig edge. Cut two adjacent sides on all three legs, as shown on Drawing 3a. Then, position a straight-edged, 3/4"-thick block on the jig, where shown in Step,2 on Drawing 3, so that the foot of an untapered side of the. leg will protrude out W from the jig edge. 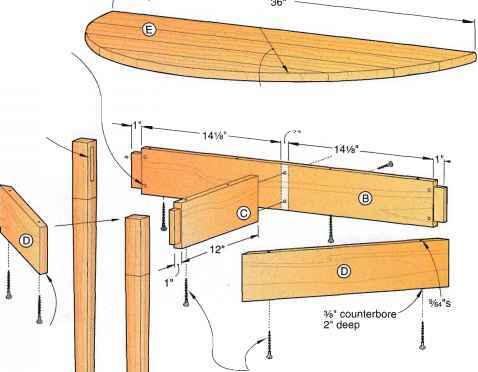 Nail the block in place, and then use the jig to taper the other two sides of the legs, as shown on Drawing 4.
be sure to mortise the face-grain side of the middle leg and the edge-grain, glue-jointed side of the two side legs. 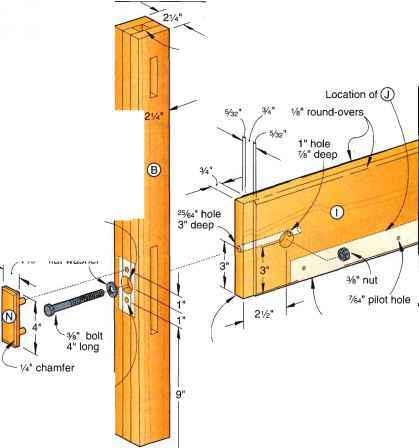 To do this, lay out the three mortises, clamp a fence to your drill-press table, and set the depth stop on your drill press. Then, make a simple jig out of W-thick scrap strips, as shown on Drawing 5, to hold the leg snugly. Drill overlapping holes using a Vi" brad-point bit until the sides of the mortise are smooth. Then square the ends using a Vi" chisel. Now, sand all leg surfaces smooth. 1T0 make the two leg supports, rip a 48" length of VV'-thick stock to 4"
How do I bevel furniture legs?